A dish that I suddenly came up with… because I have done 2 very light tasting dishes and needed a boost of flavour for dinner. 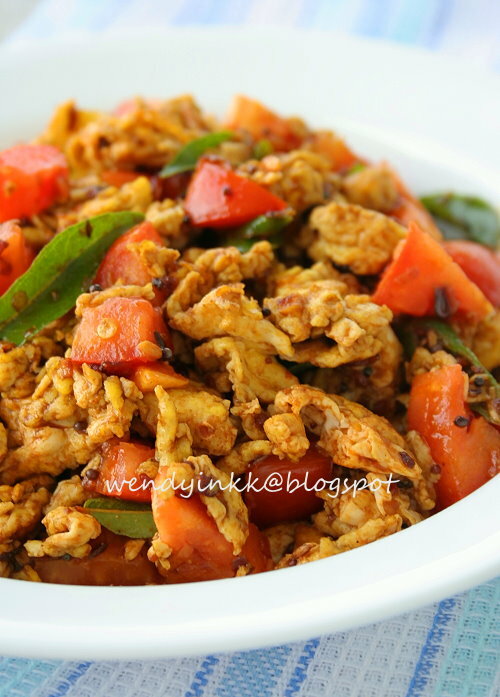 This dressed up scrambled egg became the star of the night, the pungency of the spices, the tender texture of eggs and the fresh taste of tomatoes, it's quite an experience. It's also easy to prepare, provided you already have these spices on hand. Since having my own spice rack, I make myself learn to incorporate more spices into my cooking. Although I grew up eating Malaysian food, I barely knew much about spices, besides those few that we Chinese will actually use for cooking like cinnamon and star anise, oh yes and 5 Spice powder. Spices are really interesting and with the upcoming Malaysian Food Fest event (First state is Melaka in August), I've learnt even more about spices. Not only Indian spices, but Chinese spices. Yes, trust me, the Chinese have a huge array of spices that sounds really foreign to me. I am learning..slowly. Don’t feel intimidated with spices. Try them… it’s interesting. 1. Crack all the eggs into a bowl. 2. Heat wok and put in 3 Tbsp of oil. Pour in eggs and scramble them until they are just cooked (still soft) and nicely separated. Dish up. 3. In the same wok, on medium low heat put in 2 Tbsp oil. Put in mustard seeds(these will pop as u cook) and sauté shallots and garlic until fragrant and very slightly golden. Add cumin and continue to sauté until everything looks almost golden. Put in green chilli and sauté until fragrant. 4. Put in curry powder, and salt (or chicken stock powder) and cook until you can smell the curry powder. 5. Turn heat to high. Pour the scrambled eggs back into the wok and fry until the eggs looks dry. 6. Put in diced tomatoes and give it a light toss. Dish up. I love seeing eggs, coz I can't really cook a good one..
That's a unique dish! 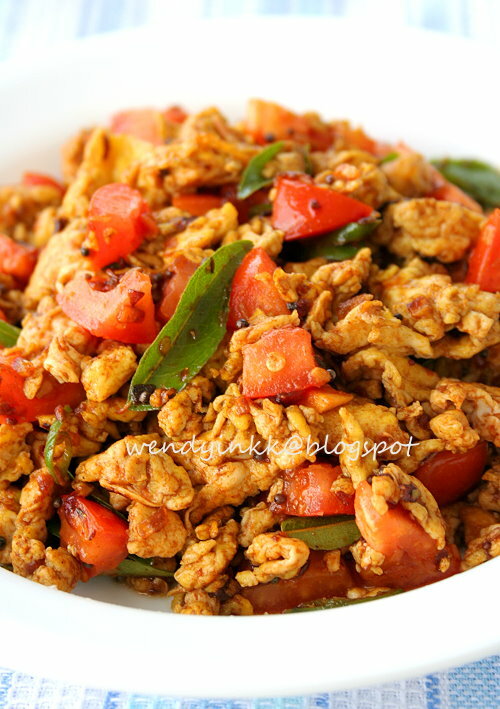 Scramble Curry Eggs, and this is something new to me. mmm..mmm...Wendy, Wendy, lei hai mo tak ding!! I thought that is chicken lol!hungry until blur liao...will try this when i need to cook. 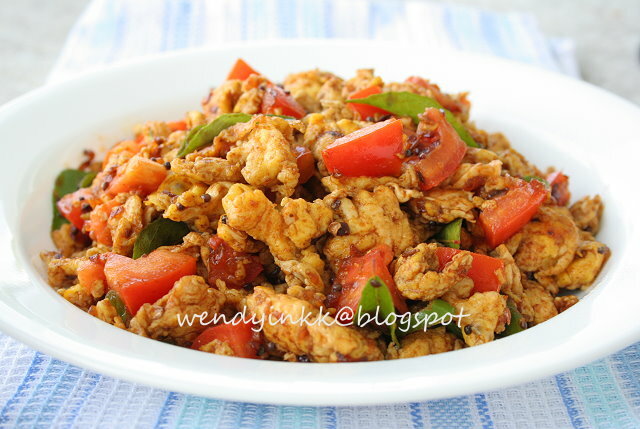 To make curry scrambled eggs, Wendy, ingenious!! This dish is fresh for me because i haven't cook this before, thanks your sharing!! hey, can share where do you get the spice rack? Can you recommend what brand of curry powder you used? Wow, this looks yummy! It will be going into my recipe collection for sure! Thanks for sharing! At first look I thought is a meat dish. eggs is one of the easiest things to cook, it's not that hard if you try. U try ah one day, ok! It's a bit of waste if you open up a pack and use just that 1 tsp. I think u're a curry lover eh? Haha, cos the way I scrambled them, is flipping the sides, I saw the technique on TV. check out "my kitchen" tab up there. It's not a bought "complete spice" rack, I just bought spices, placed them in jars and placed them on racks on my wall. LOL. Cos rarely see curry eggs like this right? always whole eggs. Brilliant!! !I will love this;) after my cough gets well... I will definitely try this out;) thanks for sharing this wonderful, simple yet appetising egg dish. Wendy, this dish looks so yummy. Look forward for more of your dishes on spices so I can buy more spice without worrying the usage lol. Very interesting recipe. Simple and delicious! It looks absolutely delicious.. Just wondering how many does these serve? That's the exact amount that I've got, that one plate.